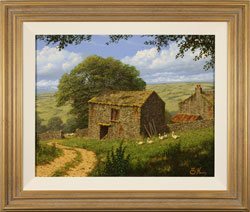 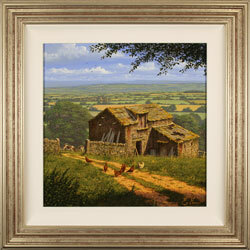 Edward Hersey is one of York Fine Arts’ most popular artists, celebrated for his ability to pair the grandeur of the Yorkshire countryside, with provincial tranquillity. 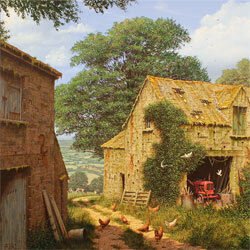 As we view Farmyard Corner, it is as though we are peering into a private world of scratching hens and startled doves. The only sign of recent human occupancy, a red tractor, humorously peeping out from a lavishly dishevelled farm building.